By Kenneth Wingerter There are so many reasons for our enduring fascination with aquarium fish. They readily exhibit a wide array of natural behaviors that can be incredibly interesting to observe. They take on every conceivable body form, ranging from elegant to grotesque. Still, if there is but one thing about these animals that never fails to capture the attention of aquarists, it is their vivid coloration. 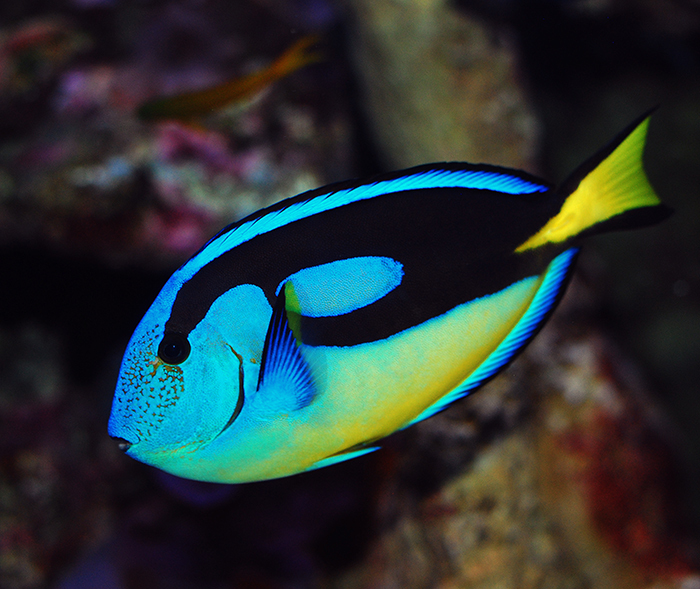 Unusual regional color variations, such as the yellow-belly morph of the blue tang (Paracanthurus hepatus), are highly prized by some hobbyists. Photo by Felicia McCaulley. It might be enough simply to enjoy these bright, showy hues for what they are; these are, after all, “ornamental fishes.” However, it takes nothing away from the subjective appreciation of these creatures’ stunning beauty to know fundamentally why they have evolved to display their particular arrangements of color and pattern. Actually, an awareness of this kind can make them seem all the more fascinating. And, in some cases, it can even provide an incisive aquarist with valuable information that can improve husbandry. 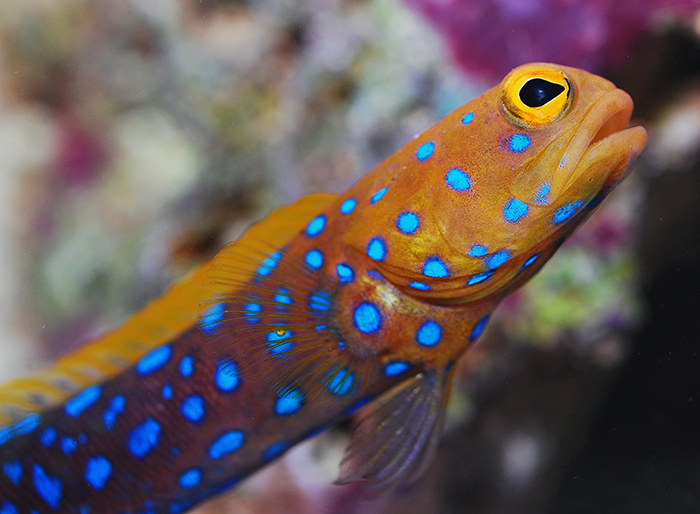 Perhaps on account of its attractive markings, the blue-spotted jawfish (Opistognathus rosenblatti) commands a significantly higher price than its closest relatives. Photo by Felicia McCaulley. This article, the first of a two-part series, will examine the myriad ways in which fish employ color to adapt to their environment. A follow-up will discuss the physiology of fish coloration in nature as well as in the aquarium. 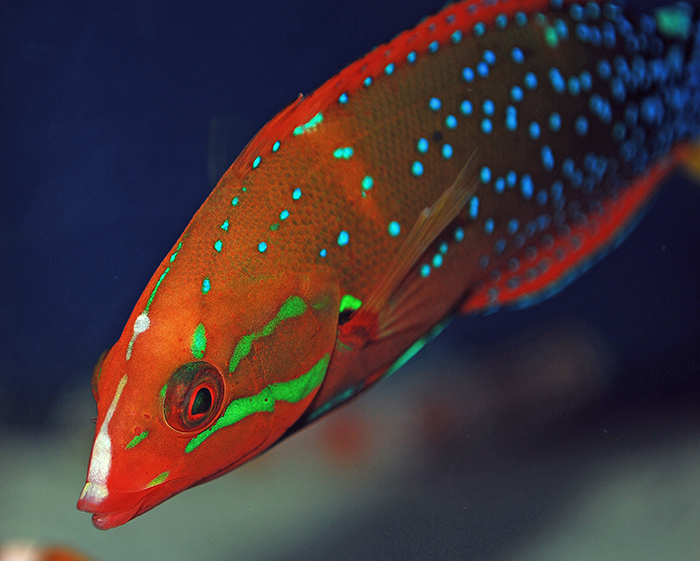 The adult coloration of many wrasses, such as this queen coris wrasse (Coris formosa), is very different from that of juvenile forms. Photo by Felicia McCaulley. Vision of Fishes Any discussion concerning the coloration of fishes should begin with fish eyesight. Most animals possess some means of detecting light. Sight organs range from rather simple photo-receptive eyespots to the complex image-forming eyes of arthropods, cephalopod mollusks and vertebrates (Freeman, 2002). Most shallow water fish species rely heavily upon sight for their survival. Sight is essential not only for detecting predators and locating food and shelter, but also for receiving visual cues that regulate behavior between conspecifics and heterospecifics alike (Lagler et al, 1962). 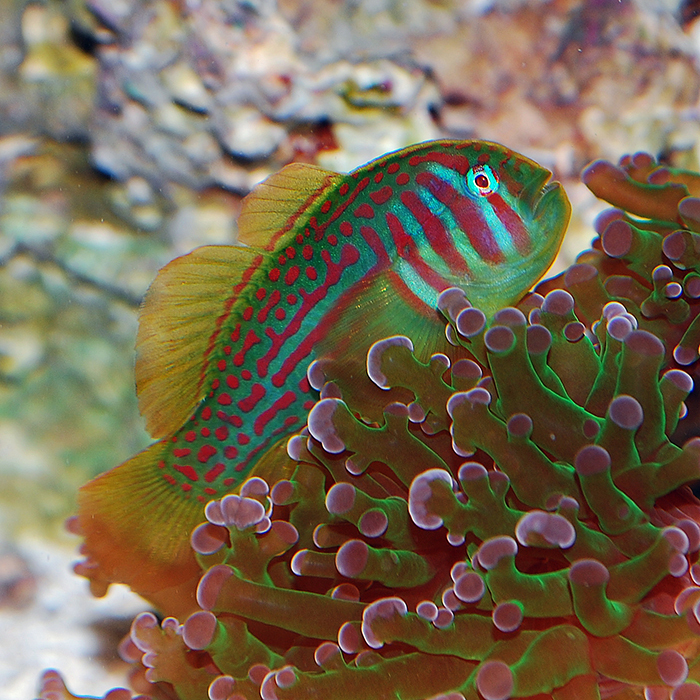 Color communication plays a prominent role in the life of many wrasse species. Photo by Felicia McCaulley. Not all shallow water fishes have developed true color vision; however, they appear to be the only fish group that claims this important adaptation. 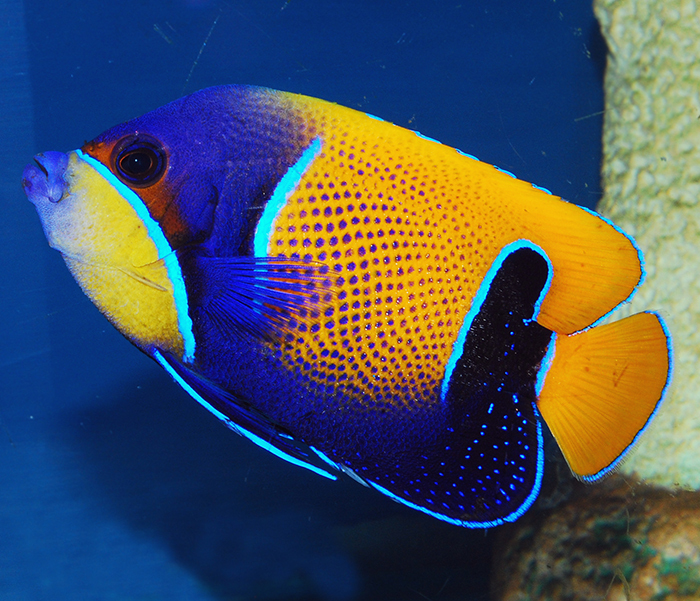 Research has suggested that coral reef-dwelling fishes in particular have excellent color vision—a capacity similar to that of humans. They are able to simultaneously distinguish contrasts of both color and brightness. They can discriminate for varying shades in a series of greys. The sensation of white seems to be different from that of hues. They are able to see complimentary colors, and can distinguish 24 different narrow-band spectra. Some species even exceed the human range into violet (Lagler et al, 1962). Some 30% of coral reef fish species are believed to have sensitivities to light in the ultraviolet range (Sloman et al, 2005). The patterns of some coral reef fishes are astoundingly intricate. Photo by Felicia McCaulley. Studies show that fish of different species have opsins (a group of light-responsive, membrane-bound proteins found in photoreceptor cells) with different peak sensitivities. One particularly unusual deep water fish, the coelacanth, bears two distinct opsins with sensitivities in the blue region of the spectrum (478-485 nm). This suggests that coelacanths are capable of distinguishing different hues of blue that humans (and other fishes, for that matter) might perceive only as a single color. An adaptation of this sort is understandable, considering that the animal’s environment is flooded in blue light; light in the yellow and red regions of the spectrum scarcely penetrates into deep water (Freeman, 2002). 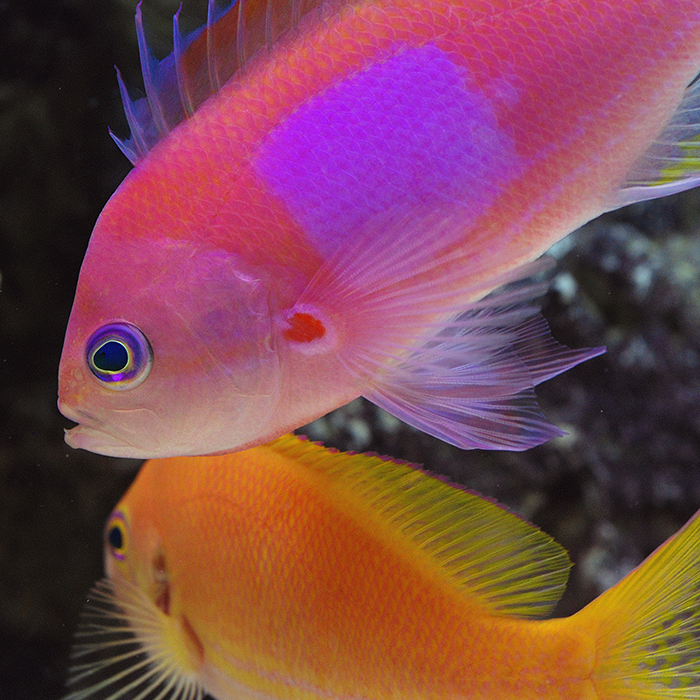 Some fishes flash bright warning colors during aggressive interactions with conspecifics. Photo by Felicia McCaulley. It is widely held that fish have poor perception of the deep red range (650–700 nm). Recent findings, however, reveal that at least some species (e.g. Cirrhilabrus solorensis) do see it quite well (Gerlach et al, 2014). Functions of Fish Coloration Determining the specific roles of color in fishes is difficult. Nevertheless, certain basic explanations for their many colors and patterns can be given on the basis of habit. A reasonable approach to this has been provided by Cott (1940), who assigned the principle functions of coloration into three categories, namely concealment, advertisement and disguise. 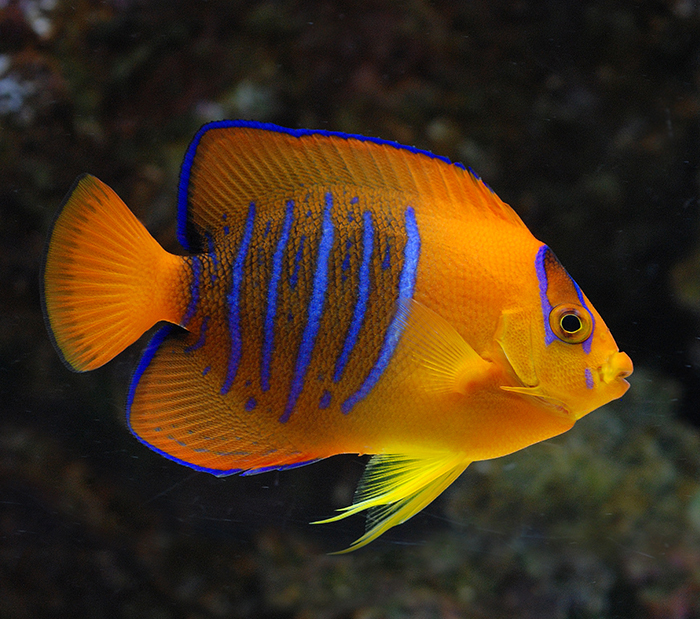 As it is with many members of its family, the coloration of the Clarion angelfish (Holacanthus clarionensis) changes as the fish matures. Photo by Felicia McCaulley. Concealment The primordial anti-predation strategy, flight, can be rather inefficient energetically. One type of adaptive coloration confers a much more effectual alternative, particularly for slower or less agile species. Camouflage (or cryptic coloration) is a comparatively simple, passive strategy that relies on the ability to blend into the physical surroundings (Campbell and Reece, 2002; Solomon et al, 2002). 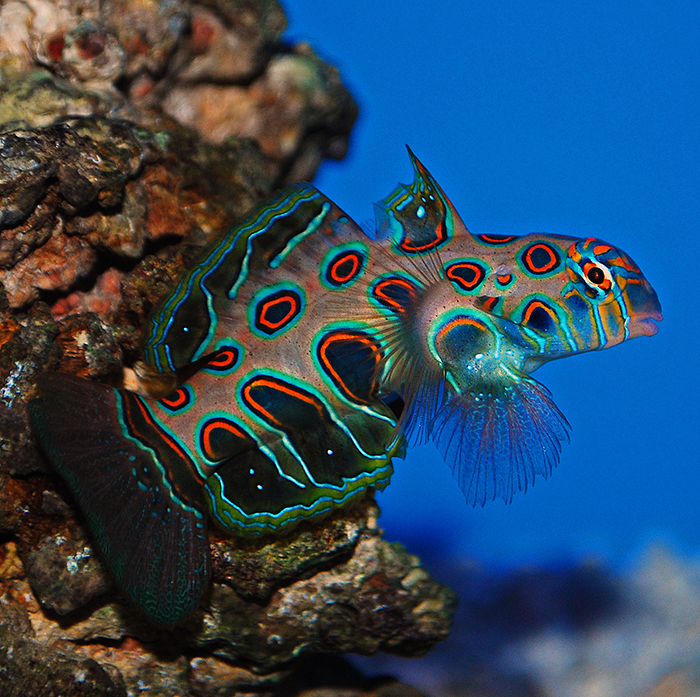 While cryptic fish are generally drab in color, those that are adapted to blend into brightly colored backgrounds (e.g. sponges, corals) can be very vibrant. The various types of color concealment have been described as general color resemblance, variable color resemblance, obliterative shading, disruptive coloration and coincident disruptive coloration (Lagler et al, 1962). 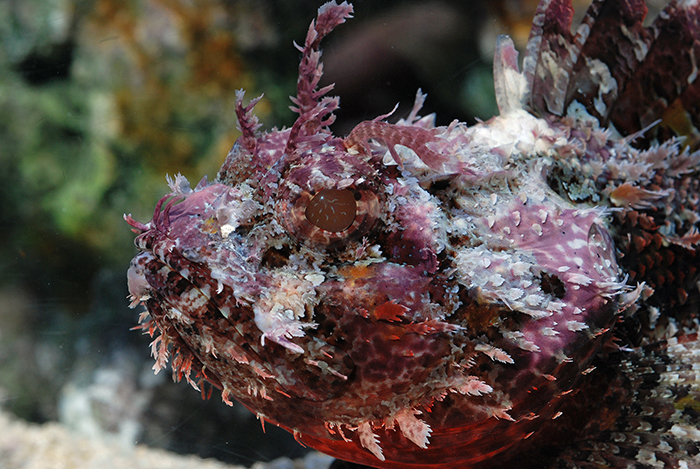 This anglerfish most likely lives among red sponges in its natural environment. Photo by Felicia McCaulley. In general color resemblance, the base colors of a fish match those of the fish’s background. In these cases, a benthic rock-dweller may have a mottled brown pattern; a nocturnal hunter may be colored jet black (Lagler et al, 1962). There can be great color variance within an individual species. Photo by Felicia McCaulley. In variable color resemblance, a fish is able to change its coloration to match changing backgrounds. Some species can change their coloration seasonally or between life history stages. 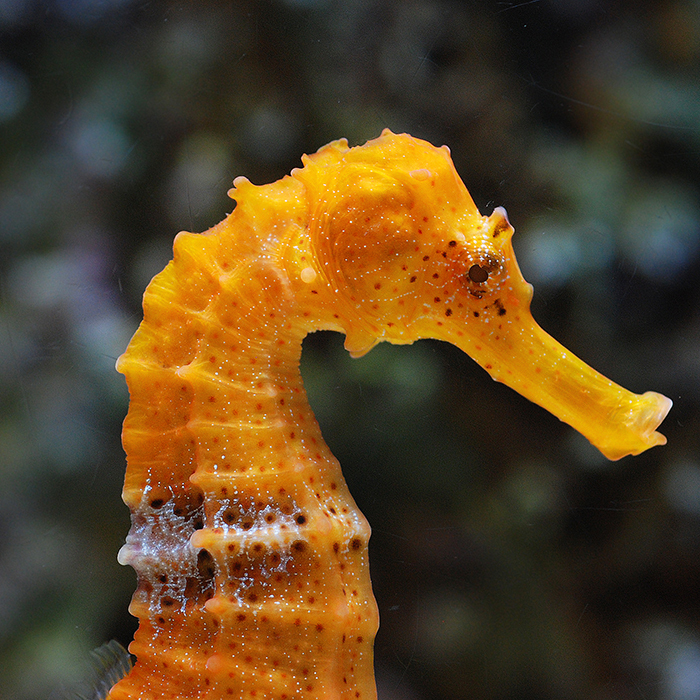 Others that tend to occupy patchy or rapidly changing habitats have developed the ability to modify their coloration almost instantaneously. A classic example of rapid physiological color change in a fish is that of the flatfishes (Pleuronectiniformes). The exposed side of their highly compressed bodies can very quickly change color—even pattern—to match the appearance of the seafloor (Lagler et al, 1962). The broken bars on the green clown goby (Gobiodon atrangulatus) likely help to conceal the fish among branching corals. Photo by Felicia McCaulley. In obliterative shading, the 3-dimensional appearance of a fish is obscured by countershading. The effect is created with a darkly colored dorsal body surface and a lightly colored underside. The two shades are properly graded in tone, resulting in a seemingly flat shape and overall reduced visibility. While a certain degree of countershading can be observed in most fishes, it plays a particularly important role in the coloration of numerous pelagic species (Lagler et al, 1962). Some fishes may be dorsally darkened to conceal them when viewed from above; the ventral surface may be white and silvery, reflecting as much as 80% of the light that strikes it, effectively concealing them from below (Hoar and Randall, 1969). Similarly, some deep water species bear bioluminescent organs on their ventral body surface, blending their silhouette with the faint sunlight above (Livinton, 2001). 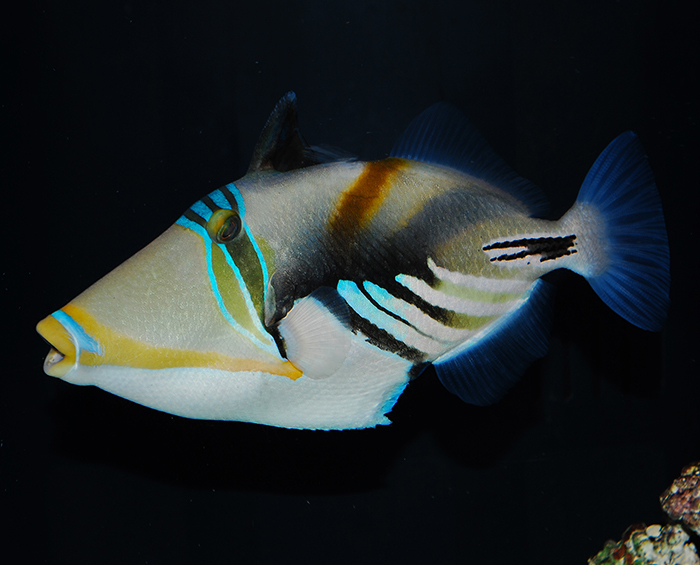 The highly developed disruptive coloration of the aptly-named Picasso triggerfish (Rhinecanthus aculeatus) is a dramatic visual display. Photo by Felicia McCaulley. Disruptive coloration uses specially placed markings to conceal a fish by obscuring the contour of its body. Generally, irregular patterns with contrasting colors are scattered across the body. In theory, a potential predator or competitor is distracted by these patterns, which confuse and distract by breaking up the apparent continuity of body surface (Lagler et al, 1962). 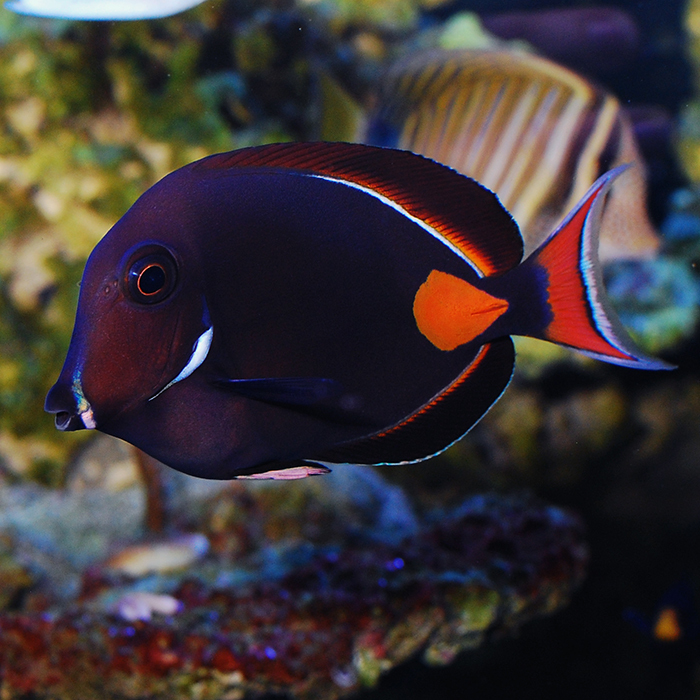 It is a strategy that has given rise to some of the most garishly colored fishes, such as the clown triggerfish (Balistoides conspicillum). 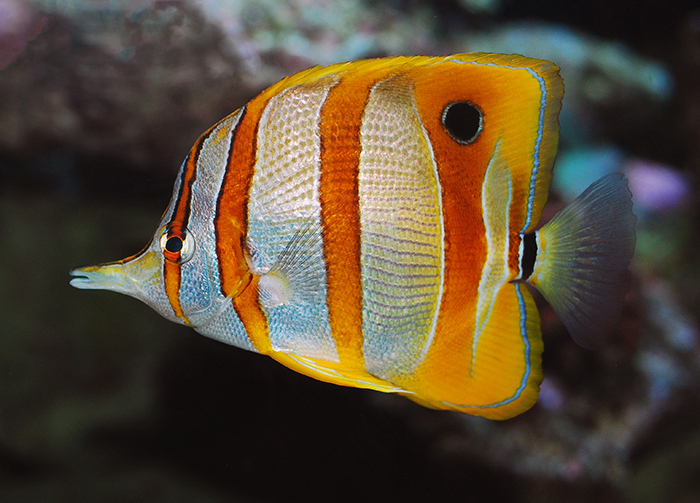 A copperband butterflyfish (Chelmon rostratus), exhibiting both disruptive coloration and deflective marks (i.e. prominent ocelli). Photo by Felicia McCaulley. Coincident disruptive coloration visually combines different, unrelated parts of the body to obscure shape (especially vulnerable organs or appendages). Probably the most common application of this strategy is eye masking; here, a dark band across the face blends with the dark pupils to conceal the exact location of the eyes (Lagler et al, 1962). A majestic angelfish (Pomacanthus navarchus), exhibiting both disruptive and obliterative coloration. Photo by Felicia McCaulley. Advertisement Many fish species are able to communicate with other animals by way of a distinct set of signals. These signals have evolved to convey very clear and concise messages. Their purpose is to influence the behavior of a potential mate, competitor or predator. A message may be transmitted by a number of means, including movements, scents, sounds and colors. Through ritualization, the combined effect of these cues is intensified (Hickman, 1995). 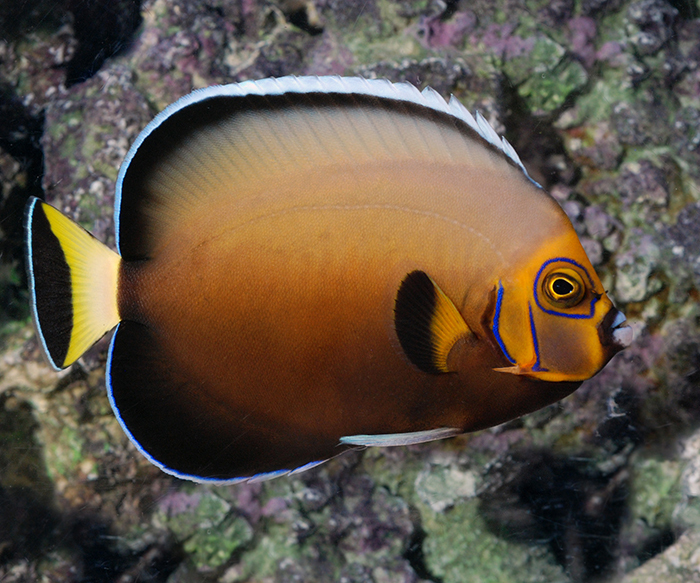 The Achilles tang (Acanthurus achilles) appears to use directive markings to attract a rival’s attention away from its face and towards its dangerous caudal spines. Photo by Felicia McCaulley. The function of advertisement should seem simple enough: it serves to make the animal conspicuous. Advertisement is employed in many different ways and for many purposes, but always serves to reveal rather than conceal. 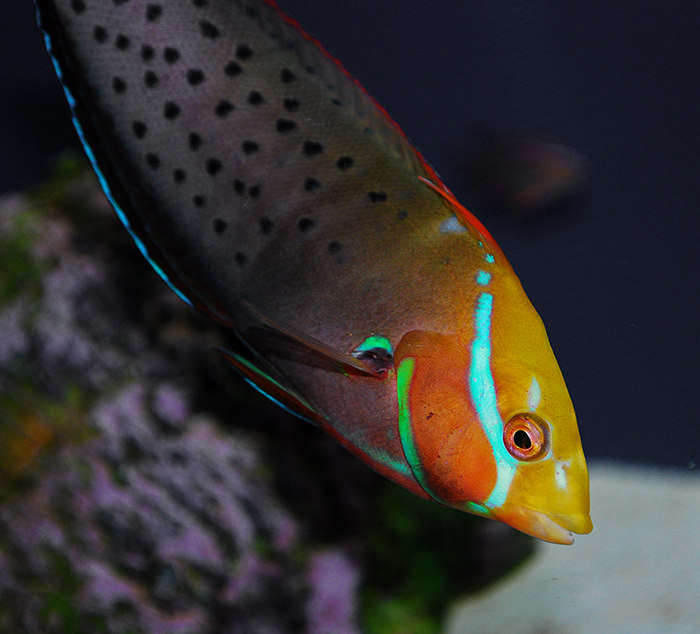 The nuptual coloration of many flasher wrasses is undeniably eye-catching. Photo by Felicia McCaulley. Cleaner fish species (those that feed on ectoparasites) often display distinctive patterns that advertise their activities. Not only does this particular type of color dress attract visitors to the cleaning stations, but furthermore seems to curb the predatory impulses of some of their more dangerous clients. Similarities of coloration between unrelated and geographically dissociated cleaner species, such as the common cleaner wrasse (Labroides dimidiatus) and blue neon goby (Elacatinus oceanops), suggest a universal recognition of certain basic color patterns. Color often plays a strong role in sexual dimorphism (i.e. any phenotypic difference between males and females of the same species). Sexual dichromatism (i.e. differences in coloration between males and females of a species) not only helps to differentiate the sexes, but may also advertise sexual maturity and readiness to spawn during courting rituals (Thresher, 1984). 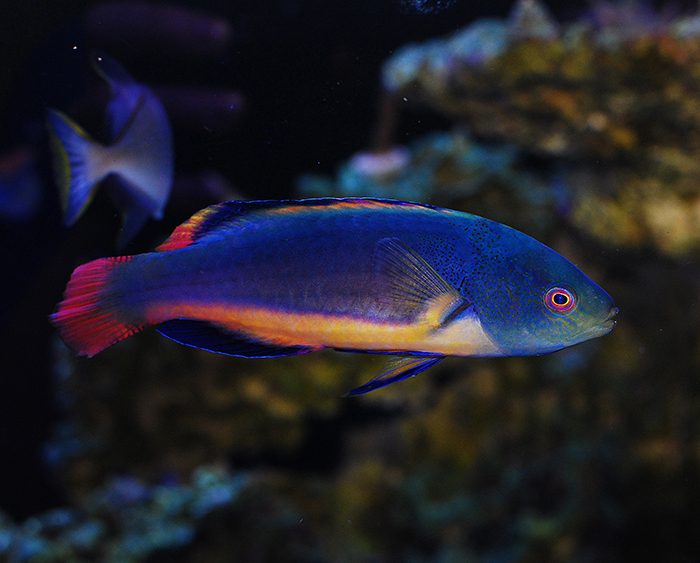 It can be quite pronounced in some families, such as the wrasses. Juvenile, initial phase wrasses may bear very different markings than those of sexually mature adults (particularly males). The coloration of males typically intensifies during courting rituals. 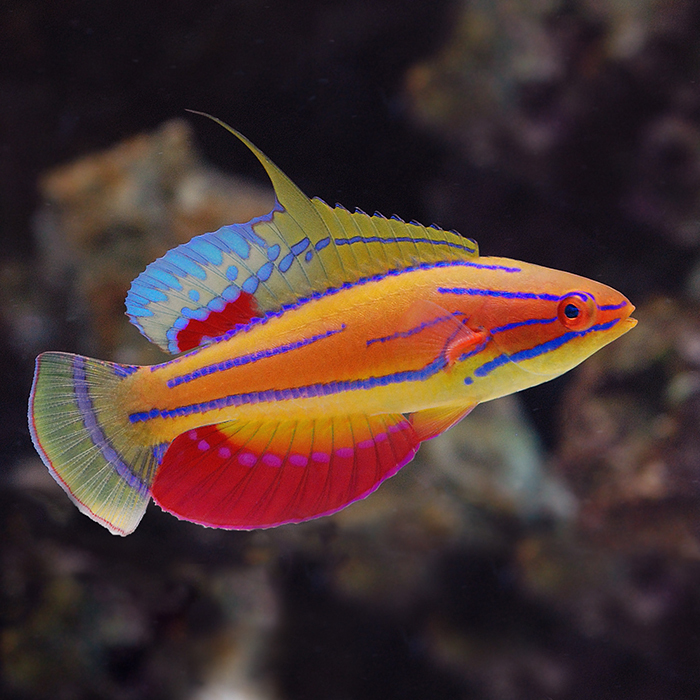 Certain wrasse species even exhibit an additional, flamboyant “super male” phase. Interestingly, male and female phases of several tamarin wrasses (Anampses spp.) were once mistakenly recognized as separate species due to their highly variable coloration (Michael, 2009). Some anthias, such as the square anthias, are strongly sexually dichromatic. Photo by Felicia McCaulley. Animals that are equipped with chemical defenses tend to be very brightly colored. Bold colors and patterns that advertise an animal’s danger to potential predators is called aposematic coloration (or warning coloration) (Campbell and Reece, 2002; Solomon et al, 2002). A particularly good example of this is the intense, psychedelic patterning of the slow and vulnerable mandarinfishes (Synchiropus spp. ), which exude a highly unpalatable mucus from their skin. Predators seem to be more cautious when approaching bright colors, presumably because aposematic prey tends to be more dangerous; the more conspicuous a fish is, the more effective it is at advertising its unpalatability. It is easiest for predators to learn to recognize a single, universal aposematic pattern. Through convergent evolution, two or more unpalatable species may come to resemble one another. In this strategy, called Müllerian mimicry, each species gains an advantage because the predator learns more quickly to avoid them (Campbell and Reece, 2002; Solomon et al, 2002). For example, the scale and skin-eating Townsend’s fangblenny (Plagiotremus townsendi) and the venomous black-lined fangblenny (Meiacanthus nigrolineatus) both gain additional protection from predators due to their resemblance to each other (Springer and Smith-Vaniz, 1972). The spotted mandarin (Synchiropus picturatus) gains protection from predation through the use of aposematic coloration. Photo by Felicia McCaulley. Disguise Disguise is arguably the most complex and fascinating type of color adaptation in fishes. Both predator and prey can gain an edge through the use of this tactic. In many cases, coloration is used in conjunction with morphology and behavior to achieve the subterfuge. For example, a slender body shape, vertical posture and green color combine to mask the bay pipefish (Syngnathus leptorhyncus) in its eelgrass meadow habitat. Consider also the Amazon leaffish (Monocirrhus polyacanthus), which not only has the coloration and even overall body shape of a fallen leaf, but also has the habit of lying motionless on the riverbed as it lies in wait of its unsuspecting prey (Lagler et al, 1962). A fish may employ both color and texture to conceal itself. Photo by Felicia McCaulley. Certain types of markings can serve to alter a fish’s appearance. 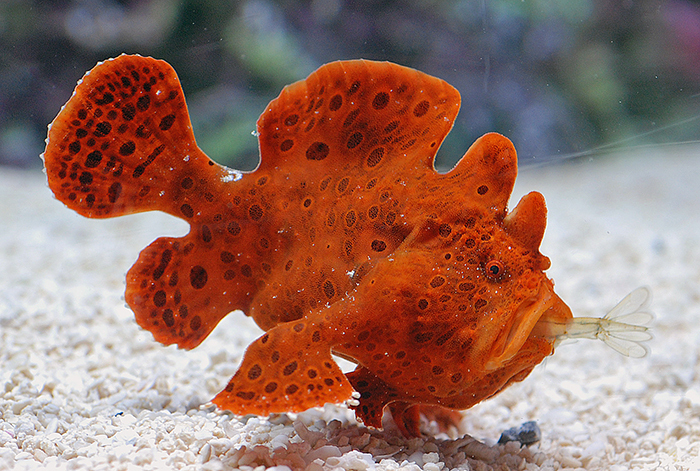 Directive marks divert the attention of prey away from the most dangerous part of a predator, and in some cases even lead them to it, in a tactic famously used by the anglerfishes. Deflective marks redirect bites and blows from an adversary towards less vital areas of the body. A very common example of this is the use of eye spots (or ocelli). These are usually dark spots, sometimes with a light colored edge, that are situated on some part of the body away from the fish’s actual eyes (Lagler et al, 1962). Some species bear a pair of ocelli on each side of the body, presumably to create the illusion of a much larger fish staring at the enemy face-on (Michael, 2009). 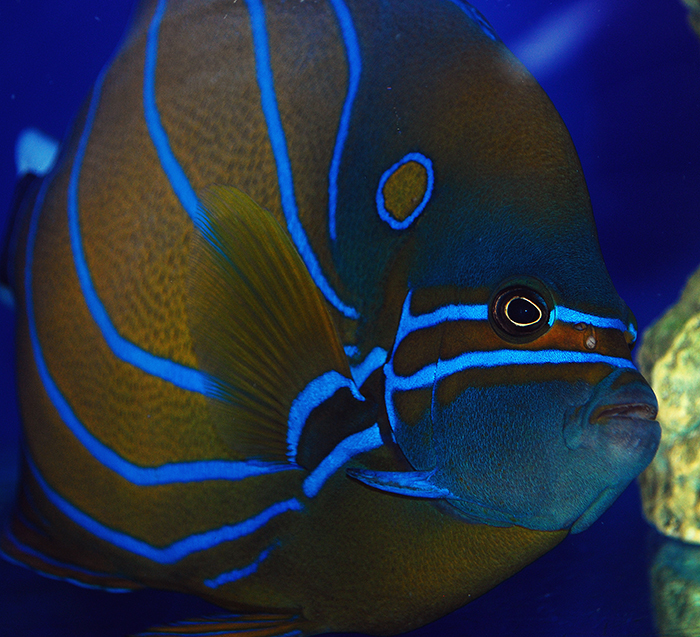 The placement of the ocelli and the curve of the stripes displayed by the annularis angelfish (Pomacanthus annularis) create the illusion of a bigger, bulkier fish. Photo by Felicia McCaulley. The most interesting examples of disguise involve those where one species altogether resembles another. In what is called Batesian mimicry, a defenseless species gains protection from predators by adopting the appearance of a harmful, aposematic “model.” For example, the harmless Red Sea mimic blenny (Ecsenius gravieri) gains some measure of protection due to its resemblance to the venomous black-lined fangblenny (Meiacanthus nigrolineatus) (Springer and Smith-Vaniz, 1972). For more information on the use of mimicry and camouflage by fishes, refer to an article by Aaron Sewell (www.advancedaquarist.com/2010/3/fish2). Lagler, Karl F., John E. Bardach and Robert R. Miller. Ichthyology. New York: John Wiley & Sons, Inc., 1962. Campbell, Neil A. and Jane B. Reece. Biology, Sixth ed. San Francisco: Benjamin Cummings, 2002. Freeman, Scott. Biological Science. New Jersey: Prentice-Hall Inc., 2002. Solomon, Eldra P., Linda R. Berg and Diana W. Martin. Biology, Sixth ed. South Melbourne: Thomson Learning Inc., 2002. Michael, Scott W. Wrasses and Parrotfishes: The Complete Illustrated Guide to Their ID, Behaviors, and Captive Care. Neptune City, NJ: T.F.H. Publications, 2009. Hickman, Cleveland P. Jr. Integrated Principles of Zoology. Dubuque, IA: Wm. C. Brown Publishers, 1995. Thresher, R.E. Reproduction in Reef Fishes. Neptune City, NJ: T.F.H. Publications, 1984. Springer, Victor G. and William F. Smith-Vaniz. Mimetic Relationships Involving Fishes of the Family Blenniidae. Washington: Smithsonian Institution Press, 1972. Hoar, W.S. and D.J. Randall (eds). Fish physiology. Vol. 3. Reproduction and Growth. Bioluminescence, Pigments and Poisons. New York: Academic Press, 1969. Livinton, Jeffrey S. Marine Biology: Function, Diversity, Ecology. New York: Oxford University Press, 2001. Cott, Hugh. Adaptive Coloration in Animals. New York: Oxford University Press, 1940. Gerlach, Tobias, Dennis Sprenger and Nico K. Michiels. 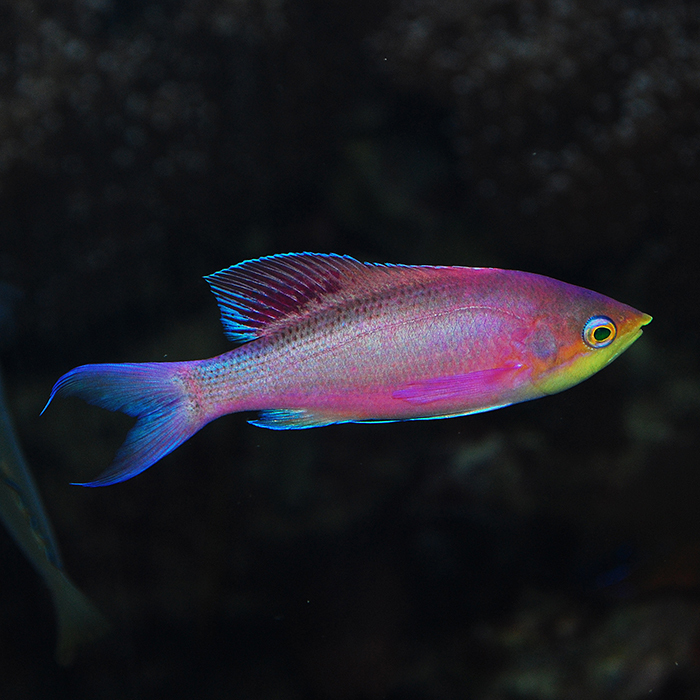 “Fairy wrasses perceive and respond to their deep red fluorescent coloration.” Proc R Soc B September 7, 2014. Sloman, Katherine A., Rod W. Vilson and Sigal Balshine. Behavior and Physiology of Fish, Volume 24. San Diego: Elsevier Science Publishing Co. Inc., 2005.